Looking forward to seeing this one on the road! I hope the exterior is worthy of keeping as-is, and you all get it mechanically dialed in. So far, so good with the steering wheel and tach. Does it have the Tisa wheels with it? And the other goodies that differentiate it from the other 1800s? Good luck and update when possible! Pretty sure on the wheels and everything else, except for the Webers and buckets. 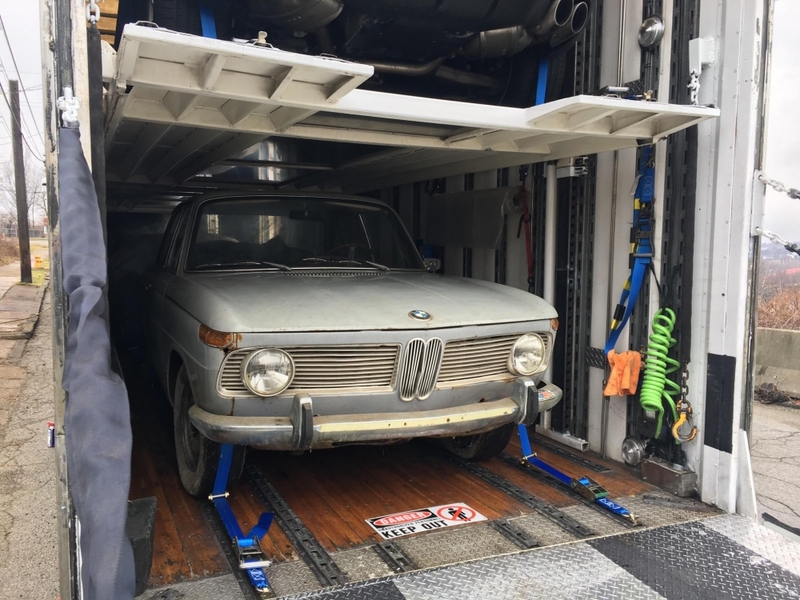 Seller has some physical disabilities that made it difficult for him to get a thorough photographic demonstration of the car, but he was sure about its pedigree. I'm hoping it gets here by the end of the month. We can see where we are then. 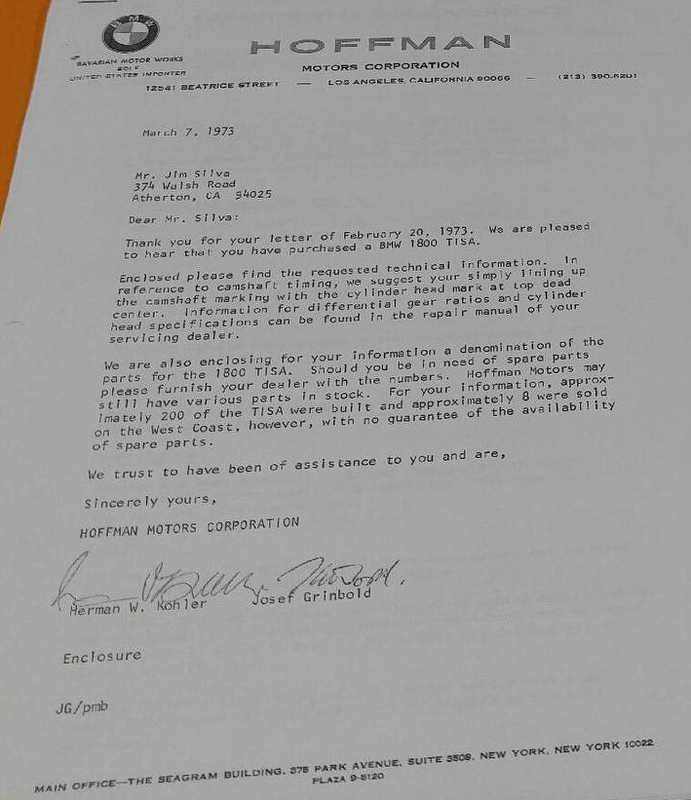 Terry recently sent me a copy of this letter from Hoffman to Jim Silva in Atherton, CA. He was asking about parts for his TiSA, and the letter included a list of TiSA specific part numbers. What I found interesting is that they say they sold 8 cars to the west coast. Anybody know total number Maxi imported? There was only 1 that I remember that came through my Father's dealership in Minnesota. There might be a few more hiding out there in the weeds. 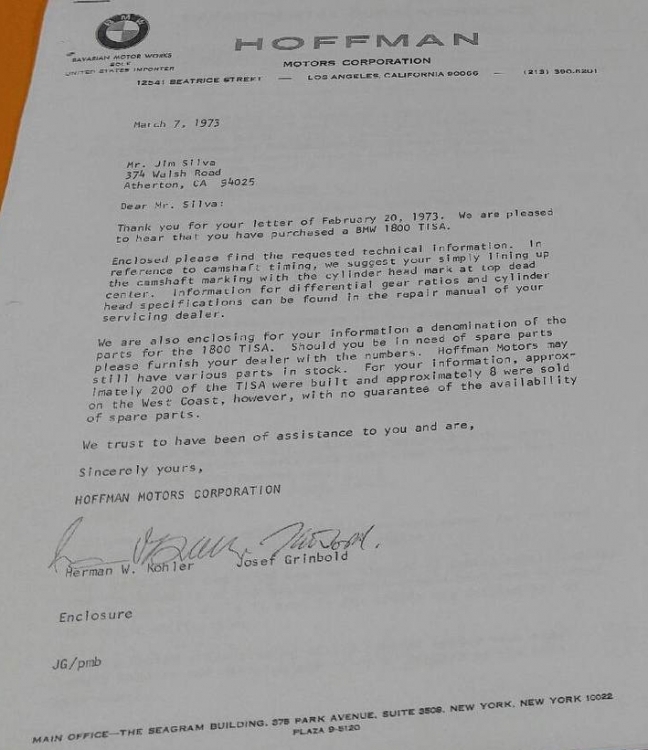 Info I have from Bill Hays, the seller, is that #133 was sold originally in Boston. Jim Holtzman (?sp) was second owner and Bill bought it from him 30-35 years ago. He drove the car for a while then parked it. If anyone can supply additional information from these leads, I'd appreciate it. Intercity is scheduled to pick up the car in Ohio at the end of this week. Here are few more real Tisa pictures (sorry, I had trouble inserting text with the above pictures), in anticipation of Bill's 133# arriving car. Bill's car has been protected, indoors, for many years and I must say that the picture of the steering wheel, tachometer and dashboard looks beautifully NOT sunbaked. Granted there is always a risk of rodents indoors, but at least the rust/sunbaking factor is diminished. The final Tisa pictured here used to belong to Richard Conway. 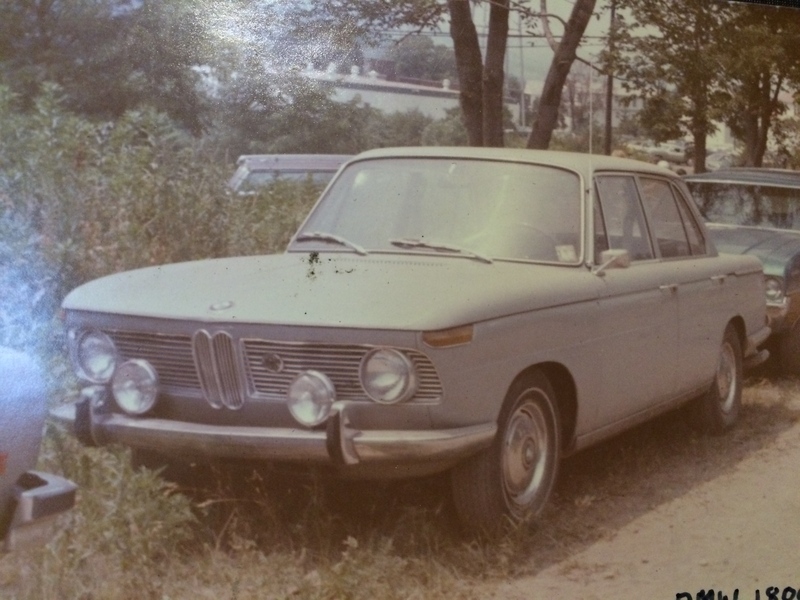 I would go and look at this car when it was sinking into the mud in Somerville New Jersey in the 1970s,(along with two other TISAs, and more than a few bathtub Porsches, Hans the owner of the BMW dealership would not sell anything, it was all left outside in the rain to rot) before I even had a drivers license. Richard purchased the TISAs when BMW demanded Hans clean up his muddy field lot, which they thought looked like a junkyard. I didn't have the foresight to write down serial numbers back when I saw this car- which was shipped to Japan back in the 1990s. A spare pair of seats, I purchased from Richard then- went to Carl Nelson, and came out of a second sister car which rusted apart completely. The second car pictured (with driving Lamps) was at Giants Despair Hillclimb in Wilkes-Barre Pennsylvania in the early 1970s, as a daily driver spectator's car, parked in the pits-I took that picture when I was about 11 years old. I think that I will ask Steve if we can start a TISA registry/thread here on the 2002 FAQ. I know of Stephan's beautiful Tisa in Germany, which came by way of Canada. Another car from Scandinavia was sold several years ago. Given that only 200 were made in total, it would be interesting to see how many survivors we can track down. I must say I am very excited about Bills car, given that it looks relatively unmolested. Anyway, I had posted some of these pictures before but they are lost in an old thread far away. It brings me some cheer on a snowy winters night to think of another Tisa being discovered and resurrected. Dang, if Peter was taking pictures of Ti/SA's when he was 11, I'm feeling unworthy to be an owner. Nick, I've looked through the UK registry and some auction sites from the past to compile a list of VIN's. If anyone has information on other cars, it could be added. Terry Forland says he's been told by someone at BMW that 25 are known--26 adding #133--so that leaves six VIN's not on my list. I know that Tom Graham's in Novato CA is #159. And a couple more in the US that I don't know the numbers of. 995013 is Richard Meinig's car. 995197 is my Dennis Simon painted Art Car. Bill the car looks very nice. I think if the shock towers and key structural components are intact you are going to be absolutely golden. It looks like a relatively well preserved time capsule. The cat, Buddy, was fussing over a TISA head and set of 45 mm weber DCOE s and agrees. Is he waiting for you to open the cat food can holding the Webers up? Yes, I think you are totally correct. I originally thought it was just because he enjoyed my company. I spent part of the day setting up the throttle linkage gaskets etc so when everything goes on the car the butterflies are correctly aligned et Cetera. #133 arrived at Racecraft this morning. I'm planning to get up there tomorrow, but Terry sent some pictures. Looks like the color is Bristol. It will need a resto. Came with Weber's even though seller thought it had Solex's. So, looks like the buckets are the main deficiency. Some arrival pictures attached.